As my office is right across from the City Market and only a few hundred feet from the City-County Building, there is hardly a day that goes by that I don't see panhandlers. As I recall, last year there was an ordinance introduced that was supposed to curb panhandling. There have been times, I've seen panhandlers at every corner of he intersection of Market and Delaware. Rarely is there not at least one panhandler at this intersection. Did I mention that the Indianapolis Metropolitan Police Department's office is in the City-County building around which much of the panhandling takes place? Didn't IMPD brass plead that the council give the department these additional "law enforcement tools" like the 50 feet from the intersection restriction and a prohibition on signs? Ever last one of these panhandlers is within 50 feet of intersections and many have signs. I saw one the other day who used a clever prop to lure in "customers." I wonder if the Councilors do not see the panhandlers who regularly violate their new ordinance when they walk to meetings at the CC building. 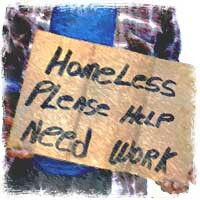 I am beginning to think that the new panhandling ordinance was all about the 2012 Super Bowl. My guess is that you can finally expect the new panhandling ordinance be enforced when visitors are in town for the week of Super Bowl activities. A few months after the ordinance passed, an article I read on theindychannel.com had some police spokesperson saying they're waiting on an interpretation of the law before enforcing it. I've seen panhandlers throughout Broad Ripple, on the circle, and near the City-County Building as well. Just like the previous panhandling ordinance, this amended one isn't being enforced as well. Waiing on an "interpretation?" You have to be kidding me. Granted the sign part of the ordinance was poorly written and could be interpreted as including political speech, but the rest of the ordinance isn't difficult to interpret. Earlier in the week, while waiting at an intersection on my bicycle, a 20-ish girl who looked like she hasn't missed a meal in years, started to walk past me. But then she turned and asked me if I had a quarter. This was only a block from the Pine St 'shelter' where the panhandlers moved to after the Davidson St 'shelter' was shutdown. As long as these encampments are tolerated, the panhandling will only get worse. Panhandling, and boorish behavior of men, and sometimes women, on the sidewalks downtown, and often elsewhere, is a big problem in Circle City. The Wheeler is the source of much of the panhandlers but they seem to have some kind of special exemption from many city ordinances. Don't let any females you care about walk by there in the in middle of the day. The taunts, panhandling, public urination is unbelievable as well as the stench of the place.